This section contains information related to Golden Air, flight code DC, a low-cost carrier regional type. If you fly Golden Air, it will take you less than an hour to get to Stockholm City or vice versa, to the entertainment capital of Trollhättan. This is the fastest connection between the West-coast and Stockholm City. Golden Air offers low-price flights between Stockholm/Bromma - Arlanda and Trollhättan. We are able to offer these low prices thanks to you yourself booking tickets via the Internet, and carrying out the payment via our homepage. 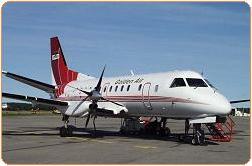 Golden Air is a regional company, with its base at Trollhättan - Vänersborg’s Airport. Golden Air is part of the Thun Group, which is active in the field of shipping, real estate management and the aviation industry. Erik Thun AB is the name of the group’s mother company. This company looks back on a 65 years-old tradition in Swedish and international shipping, with a focus on coastal- and regional shipping. Click to browse to the network development section of this site, featuring more more information on the network development of Golden Air.